Medline's strong, absorbent table paper protects exam tables from dirt and moisture while offering comfort and protection for patients. Choose from smooth or crepe finish (crepe is softer, quieter and more absorbent). Crepe is also more textured which will help prevent it from sliding on surfaces. 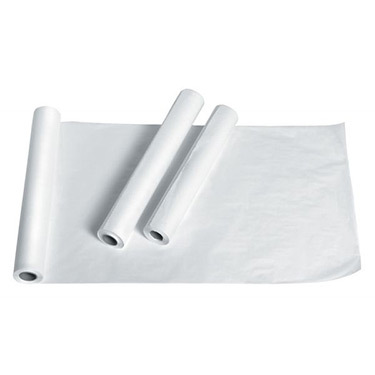 All rolls are mechanically metered for exact length and individually poly bagged for cleanliness during shipment and storage. Color: White. Standard weight paper, Smooth. Available in 4 sizes. 14 1/2 W x 225 L ft., 18 W x 225 L ft., 20 W x 225 L ft., 21 W x 225 L ft.